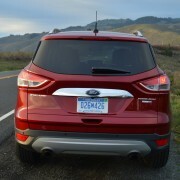 Ford’s Escape moves into 2016 largely unchanged. 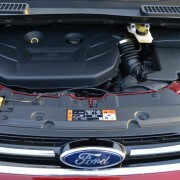 If you are savvy, you will order your Escape with the most powerful engine available in the model range, the 2.0 liter EcoBoost motor, which makes 240hp and a whopping 270lb.-ft. of torque thanks to direct fuel injection and a turbocharger. This optional engine will set you back an extra $1,115, and it’s worth that much and more. 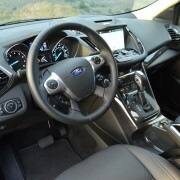 Coupled to a 6 speed automatic transmission, with real gears instead of the CVT belts so often found in entry level SUVs these days, the diminutive Escape proves a very lively performer. 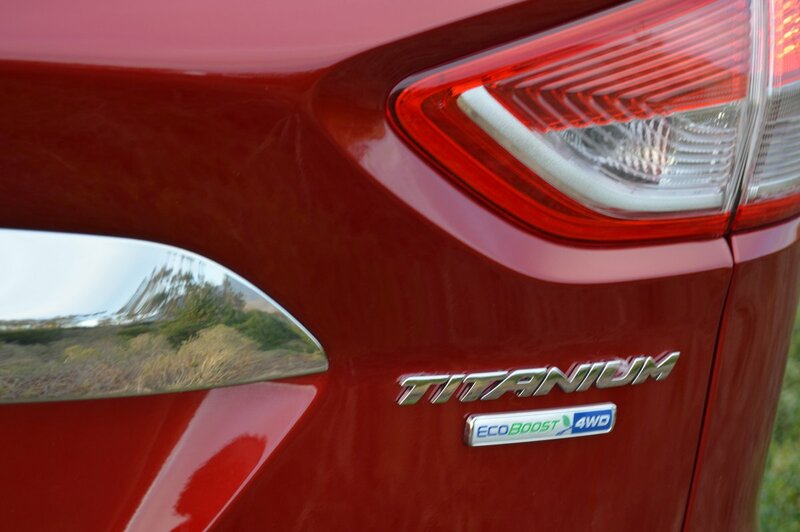 In a solid week of driving, the EcoBoost motor always responded instantly to power demands with a satisfying thrust that belies its excellent fuel economy of 22 MPG City and 28 MPG Highway. If you also check the order form for the Titanium 4WD model, you will find yourself paying a premium of $4,085 over the less expensive SE 4WD model. But the extra four thousand dollars buys you a raft of worthy improvements including exterior rear view mirrors with built-in turn signals, remote trunk release and power lift back, premium sound system, HD radio, 10-way power leather front seats, mirror and seat memory, keyless start, leather steering wheel, multi-zone climate control and A/C, heated front seats with lumbar adjustment, and rear parking alert with cross-traffic warning. 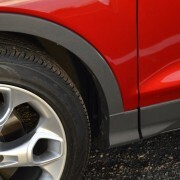 All of these features integrate seamlessly into the make-up of the Titanium Escape, upping your enjoyment of the vehicle without breaking the bank. 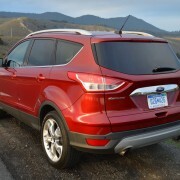 In addition, Ford supplied our test Escape with a couple of pricey extras you could probably eliminate without discomfort. 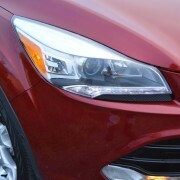 The $1,514 “Equipment Group 301A” improves headlight efficiency with HID units (versus standard Halogens), and also adds blind spot detection sensors to warn you of invisible obstacles. 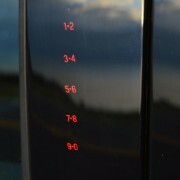 It also upgrades parking beepers to “Parking Assist” status front and rear. 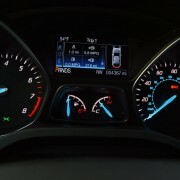 A navigation system boosts the bottom line a reasonable $694, and is unusual in that Ford makes it available as a stand-alone option. 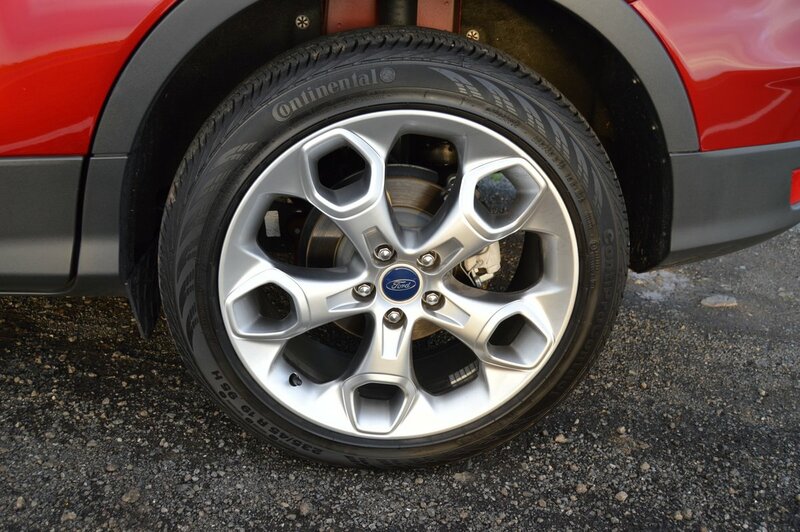 Finally, you’ll definitely want to invest in very handsome and useful 19 inch alloy “Luster Nickel Wheels” which are also bargain priced at just $607. 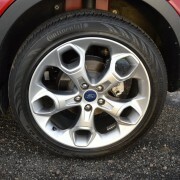 If you opted for aftermarket 19 inch alloys, you would pay double this amount and they would never look this good. The intricately cast wheels are wrapped in Continental ContiProContact rubber (235/45R19) which proved tenacious in wet weather grip. 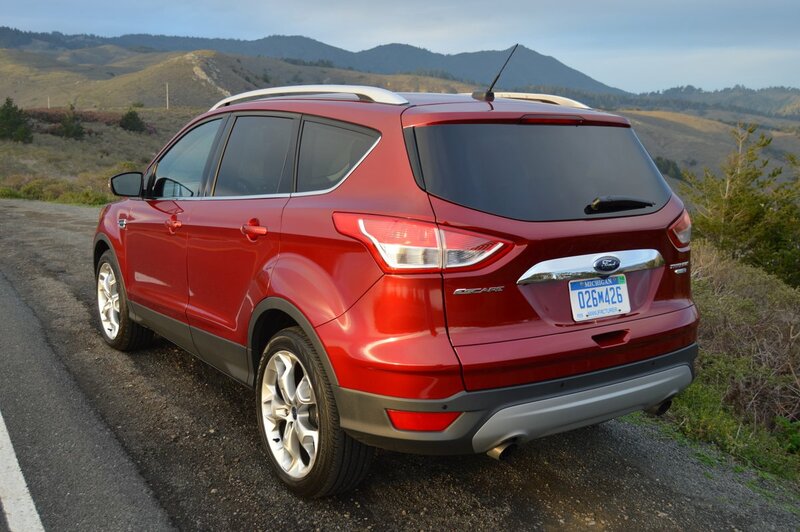 Escape’s 4WD traction keeps these Continentals pointed in the right direction at all times. 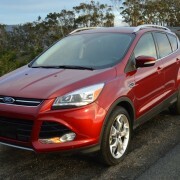 The Escape has come a long way since its introduction. Originally, this model looked prosaic, lacked flair and performed without distinction. 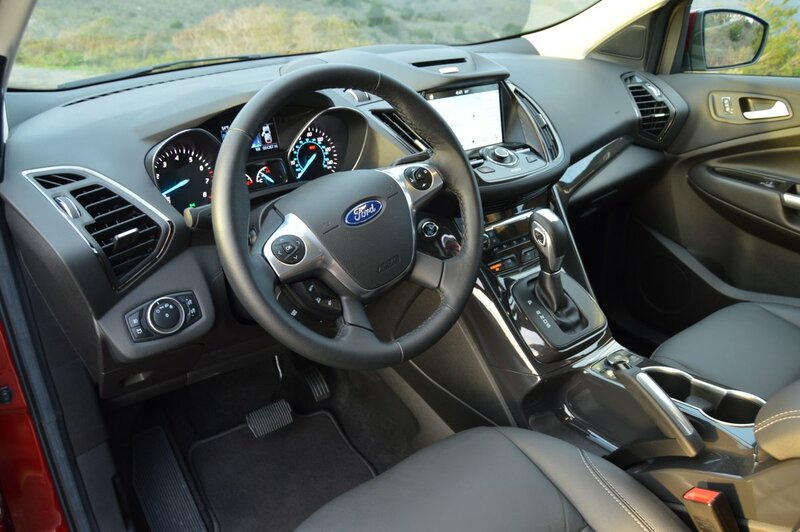 But Ford has reworked the Escape to the point that it has become a legitimate contender in a tough SUV class containing such standouts as VW’s Tiguan, BMW’s new X1, and Subaru’s Forester. 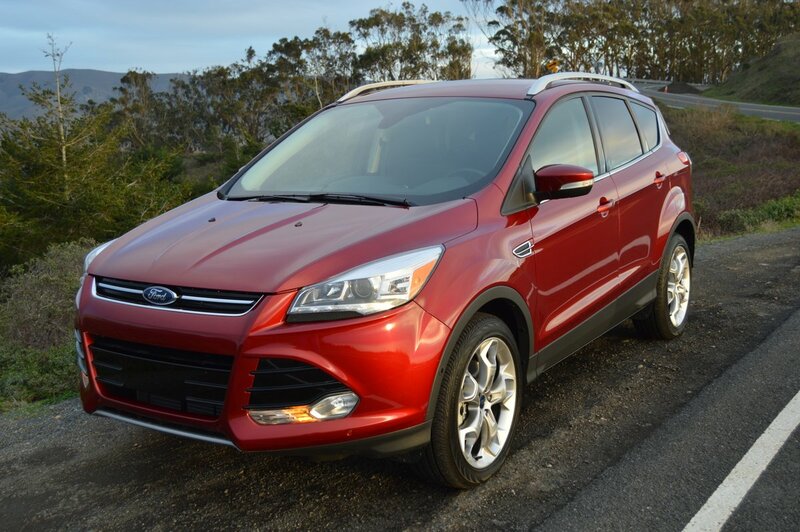 In this elevated company, the Escape now stands its ground, but only if equipped with the Titanium niceties, 19 inch wheels, and EcoBoost motor of our test model. 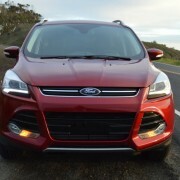 In that guise, if you compare it to any other small SUV, you’ll discover Escape matches up so well you can save thousands of dollars buying the Ford. We especially loved it for its 5 stage heated front seats, which permits more comfortable temperature adjustment than almost any similar product on the market today. The elevated seating position in the front row promotes excellent sight lines in all directions. 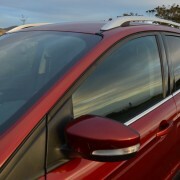 Even though our test vehicle lacked the optional ($1,305) Panorama Roof, we never missed it because the interior is always bathed in light thanks to tall side windows, and a fishbowl of a windshield. Also, the optional blind spot warning devices provided by package 301A are much less obtrusive than those of most competitors. Instead of needing to shut them off at the start of each trip, we let them tweet their occasional alarm without ever feeling harassed. 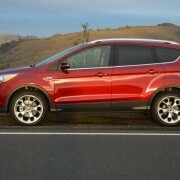 This minor feat of engineering accomplishment is characteristic of the Escape Titanium as a whole. 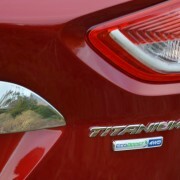 Ford has achieved a commendable balance here between price, performance and livability. You would be hard pressed to improve on the Escape by looking elsewhere.